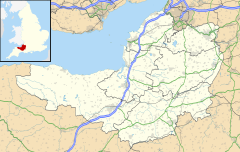 Weston-super-Mare, sometimes known as just Weston is a sea-side town in Somerset, England. Weston is 18 miles (29 km) from the city of Bristol. It also includes the suburbs of Oldmixon, West Wick and Worle. The beach is a popular tourist destination and includes many museums, a pier and an aquarium. Weston is linked to the M5 motorway by junction 21 where the daul carriageway A370 goes to the town centre. Today, the main railway station, which is on a short loop off the Bristol to Exeter line, is called Westo-super-Mare and is situated close to the town centre and less than ten minutes walk from the sea front. ↑ "2011 Census Profile". North Somerset Council. Archived from the original (Excel) on 4 January 2014. Retrieved 4 January 2014. This page was last changed on 24 December 2018, at 23:18.